In an incredibly fun and accessible two-color graphic-book format, the cofounders of Honest Tea tell the engaging story of how they created and built a mission-driven business, offering a wealth of insights and advice to entrepreneurs, would-be entrepreneurs, and millions of Honest Tea drinkers about the challenges and hurdles of creating a successful business--and the importance of perseverance and creative problem-solving. BARRY NALEBUFF is the Milton Steinbach Professor at Yale School of Management, where he teaches negotiation, innovation, and strategy. He is the coauthor of Thinking Strategically, Co-opetition, Why Not?, and The Art of Strategy. A graduate of MIT, and a Rhodes Scholar, he earned his doctorate at Oxford University. He has been a columnist for Forbes, and a regular commentator on Marketplace. SETH GOLDMAN is the president and TeaEO of Honest Tea, which he cofounded with Barry Nalebuff in 1997. He is an internationally recognized spokesman for mission-driven enterprise and sustainability. He appears regularly on MSNBC, CNBC, and Fox. He blogs for Treehugger.com, Inc.com, The Huffington Post, and the New York Times. "The honest voices of Seth and Barry coupled with the humanity of each scene drew me in and made it easy to read this brilliant business book disguised as a comic. A must-read for budding or well-rooted entrepreneurs—or really anyone interested in what happens behind the scenes at a start-up. I loved it!" "When Seth left Calvert to launch Honest Tea, I was puzzled how a bottled tea venture could be so meaningful. Now I know. 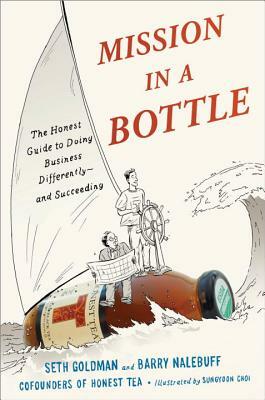 Mission in a Bottle is a courageous, engaging, and frank story around his inspiring example of social entrepreneurship. I read it in one sitting." An utterly engrossing story of the frustrations and ecstasies involved in transforming a simple idea into a hugely successful bsuiness. Anyone who has ever been curious about the inner-workings of a start-up will find this intimate account both refreshing and--need it be said?--honest.